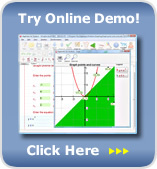 START SOLVING YOUR MATH HOMEWORK IN LESS THAN 5 MINUTES! YES, rush me the Algebrator right now! I want to stop banging my head against the wall trying to guess complicated algebra problems. I want to have my algebra problems solved and explained so I have time to do other things. If I order Algebrator now, I can receive a 30 minute live tutoring session for a $1. I will be able to access LIVE TUTOR with a single click of a button from within the software!